Many times simply cleaning the trap or using a plunger can be helpful to clear clogged plumbing, but when this does not do the trick it is time to try a more advanced tool in the plumbing arsenal. The tool we use is called a plumbing auger and is often referred to as a “plumbing snake” or “snake” for short. It is a tool which is coiled like a snake (hence the name) and is about a quarter inch thick with a handle on one end that you use to crank the snake down into the plumbing to break up the clog and remove the debris from your pipes. Like most tools you have a manual version and a powered version. Depending on the extent of your clogged plumbing we carry both on our vans. Texas Master Plumber has the right tools for the job. Call Texas Master Plumber today and will assess your plumbing needs to determine the best course of action to get your plumbing working fast. Augers or drain snakes are relatively easy to use and the principal behind them is quite effective at removing clogs in your pipes from things like hair, grease, or other things that regularly condense to form an obstruction in your pipes. The process of using an auger is pretty straight-forward. You advance the auger down the pipe until you feel the obstruction. The auger has a tip that is made to grab the obstruction; however, often times it is easier to push through the obstruction and break it apart. While these tools can be purchased at local hardware stores it is recommended that you contact a plumber to perform the services. This can often times be a messy job and sometimes even an avoidable job. A qualified plumber like Texas Master Plumber can usually resolve the problem without having to resort to this more invasive method of plumbing repair. 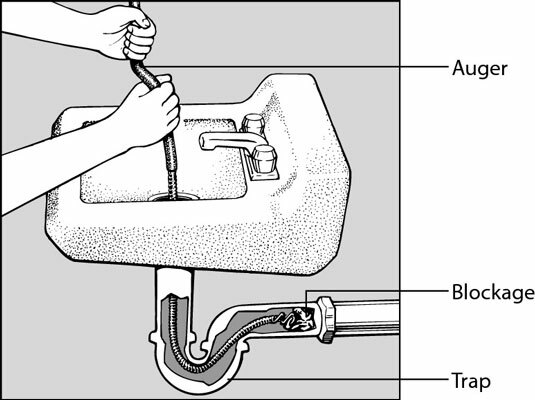 If the blockage is further down the plumbing, a typical plumbing auger will not be able to reach the obstruction. Texas Master Plumber also has camera equipment to locate and remove plumbing obstructions that most plumbers don’t carry. Call Texas Master Plumber today for your plumbing problems. If you need a drain snake or auger service, Texas Master Plumber is the right choice for this and all of your other plumbing needs. Texas Master Plumber is a qualified plumber. Our trained telephone operators can help give you an idea of what interventions may be necessary and then schedule your service call today. Texas Master Plumber offers same day/next day emergency plumbing services too! If you have the need for same day/next day emergency auger service, give Texas Master Plumber a call today! We use state-of-the-art plumbing tools and have qualified plumbing technicians available around the clock to help you with all of your plumbing problems. You can also contact us using our convenient online form. Thank you for your business!